At the end of 2012 I went through a pretty rough patch. Like, a too-sad-to-even-eat-pizza-rolls, self-medicate-through-exercise, cry-over-your-pho sort of rough patch. So, like anybody who’s ever read O magazine, I decided to start a gratitude journal to help me get through the darkest days. Some entries were “styled hair and left house” or “cute new hedgehog eraser.” Of course, after a few months things started looking up and I was eating pizza rolls and slurping pho sans tears. But I kept writing in my gratitude journal every night before bed. Everyone ever will tell you that gratitude and happiness are intrinsically linked. So I didn’t see any reason to stop chronicling the sweet, mundane parts of my day, even though I was out of the ‘cry all the time’ woods – and I’ve been doing it nearly every night since. A few weeks ago, while laying in bed writing up the best bits of my day, I absentmindedly wrote out the next day’s to-do list on the opposite page. It wasn’t anything fancy, just some bullet points of what I needed to get done but it brought me a lot of comfort. 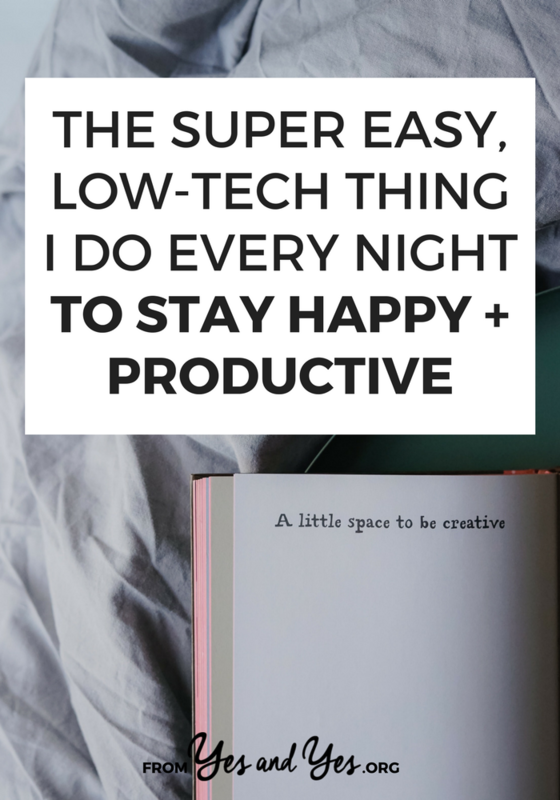 I could go to sleep without worrying that I’d forget about sending that email or writing up an editorial plan for a client. I felt like I’d planted a seed in my brain and that it would noodle on without me – creating solutions and coming up with ideas while I slept. Since then, I’ve ended every night with two lists of five items on opposites pages. I’d made a habit of it. The left page is five awesome/silly/wonderful things that happened that day. The right page is five things I need to work on in the morning. These lists tie my work + gratitude together in my brain. They remind me that I love my work and I’ve chosen to do it. They force me to limit the number of to-dos I assign myself. All that goodness! With just a notebook and pen! P.S. If you need 1-on-1 help being more grateful or productive, I can help with that! I think any way of making a note of things to be grateful for daily is a wonderful project, whether it's a journal, a jar, a garland… And it's a really good idea to add tomorrow's to-do list! It kind of lets you focus on all the good parts in life and then you get to make it even better tomorrow. I don't have a gratitude journal, but I think I'd love to start one like yours someday! I don't have a gratitude journal per say, but I have a gratitude email with two of my best friends. Each night, we send each other what we're grateful for that day. It keeps me accountable, and helps us keep in touch, seeing the important bits in each other's lives each day. I'm a couple time zones ahead of them, so I write mine at night, then first thing in the morning, check for theirs. It's a lovely list to wake up to. Lauren! That is SUCH a good idea! I'm going to see if my friend in New Zealand will do that with me! At this point I think the world is saturated with mentions of gratitude journals so I love that you've added another layer and tied gratitude/joy to productivity! I've thought a lot about the idea of "chosen work" and generally refer to outside-of-full-time stuff in that way, and the term is always a reminder that I've elected to do it…so I can choose it every time and feel empowered and happy. I love the idea of planting a little seed for your brain to noodle on overnight. I don't keep a gratitude journal but i have a good things jar this year to capture some of the bigger happy moments. I have been making a daily "to do" list for many years now and checking off what i accomplish..and carrying over things I didn't get to for the next day. I have a fancy Moleskine Daily Planner for doing this and it makes me a lot more productive. I'm starting to write my goals down daily. Keeping some form of a gratitude journal makes sense to acknowledge all that is currently happening- right now- not just what I'm working towards. I like it. Thanks! I did this years and years ago when Oprah plugged it. I haven't done it since but now your idea of adding in the "to do" list for the next day I think will help me sleep better. I'm often laying awake at night putting together my mental list of everything for the next day and it makes it hard to get to sleep. You are a genius. Love this. I write a gratitude list every night since three weeks ago. Makes me go to bed happy and content :). I did this through a six-month rough patch as well! It helped me appreciate nail polish/bagels/cheap books on Amazon/etc enough that everything else is never really terrible anymore. I don't write it down in a journal (maybe I should to reflect back upon) but I do count the day's blessings each night in bed. I also try to start each day with a prayer to live intentionally & with purpose. It helps me bookend my day with positivity. It definitely does contribute to happiness! I love this combination and I think I'm totally going to start doing this. It's a perfect way to close the day and set a rough outline for the next. With the new year I've started to make what I'm calling a "Done List" at the end of the day. Just a list of all the little acomplishments that reminds me of all the productive things I DID do, so that I don't focus on all the things I DIDN'T finish. I'm loving the habit. I do something similar too 🙂 I keep a calendar on my desk anyway, and a while ago I bought a bunch of little green circle stickers. Now I track all my "done/achieved" items in my calendar and stick a little green dot next to it, even if it's just a step on the way to something larger I've achieved. I write in a journal every day but I often find myself focusing on the negative rather than the positive. This sounds like a great way for me to focus on the good things I've got going on. I call mine a Happy Journal, and I write in it every night as well. I don't feel dorky saying it, though! "That's goin in my happy journal!" is something I say rather often. 😉 I love your idea of simultaneously creating a to do list. That's a really good practice. Anything that makes YOU happy. That YOU are grateful for. Never mind what other people think. This is so timely. We just decided to get our Year 8s writing in gratitude journals as a part of their Personal Development unit. Hopefully the girls will find it as useful as you did. But what I do is write my to do list every night. That way, all those super important things (like.. laundry) are down on the paper and out of my head. Love this. The idea of what you're grateful for that day and what you'd like to accomplish the next are very complementary. And I like that you cap your to do list at five items, so reasonable and doable! I do this too, I had a period of being sad a couple of years back, but writing a happy list every night is really helpful. I have my to do list on a white board in the kitchen where I can see it, along with a star chart I've made myself for doing the cleaning every day! 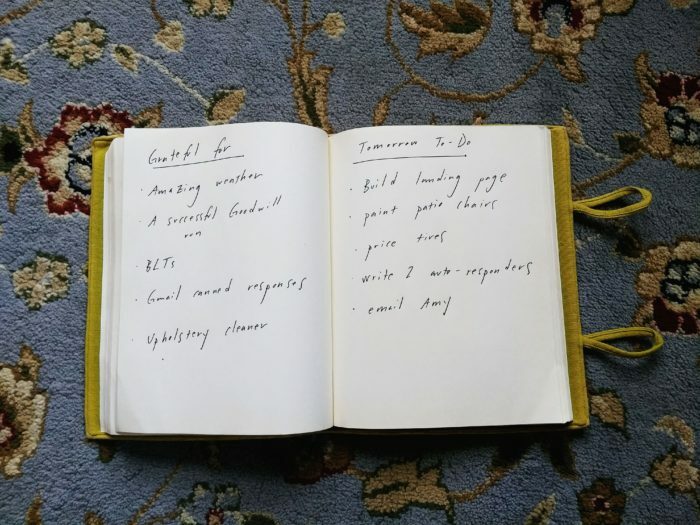 What I love about this is the connections you'd start to draw over time between your to-do list at the beginning of the day and your gratitude list at the end of the day. You'd start to see what kind of things/people/experiences consistently make the gratitude list, and you could build more of those into your to-do list. Or conversely, you'd see if to-do's that you think will make you happy and grateful end up being underwhelming, and redirect your time and energy. Obviously wouldn't work for everything (everyone's gotta laundry sometime) but it would be really interesting to see. I also allow myself to not force things and be absent from doing this, depression is a beast. The "styled hair, left house" understand it, entirely. dont wish to go through that again. but changes are certain, I hope I can somehow navigate once it happens, if again. I think I want to start gathering a little to do list, if not nightly, at least weekly. It seems like a great way to gather your thoughts, get focused, and be a little more productive. Thanks for sharing what you do Sarah! I do a gratitude journal too but I LOVE the idea of just writing a few things down for the next day. What a great way to start the next day with focus! It's a very very very good idea !